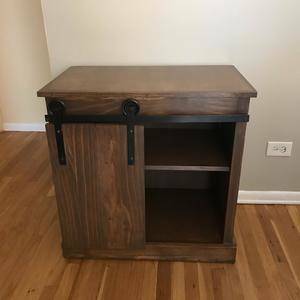 I made this barndoor nightstand as a bridal shower gift for my brother's fiancee. They just bought a new apartment and needed some new furniture pieces for their second bedroom, so I thought this would be great to make for them (versus just giving money). I am happy to say they love it! My brother's fiancee likes it so much that she does not use it for the second bedroom but instead moved it into the dining room. It currently holds their nice dinnerware with a vase of flowers on top.